April 15th stopped being referred to as “Tax Day” for me a long time ago. That date forever changed once my doctor assigned it to my second child as the much-anticipated due date. In the heat of August 2010, ultrasound photos in-hand, I started to envision the child I carried in my tummy and the happy future that was sure to come with this surprise baby. Just days after seeing my little one in the womb, I was forced to say an abrupt and heart-breaking good-bye. Every hope and dream I had been carrying came to a crashing halt. I’d never felt such a hurt in my heart. I’d never been faced with such an agony that literally pulls at the pit of your being. It was an experience that changed me, deeply. My eyes lost their innocent sparkle that night. My heart became tainted with worries I never knew I could carry. Miscarriage can wreck a woman, friends. I was wrecked that lonely weekend in late August – mind, body and spirit. But, thankfully, that wasn’t the end of my story. It was only the first chapter. The healing that came in the months and years to follow is why I am who I am today, and why I can say with joy and boldness that my child is still very much a part of me, our family, and my life. When I opened up about my experience on this blog, it also opened many doors to speak with close friends about their own. During an impromptu play date with two of my close friends, who are also bloggers, we just started talking about our miscarriages over coffee cake. The kids played and we chatted away…sharing our stories…our challenges…the surprise and disappointment we felt at the lack of resources available to moms like us. It was then that we decided to change that, together. 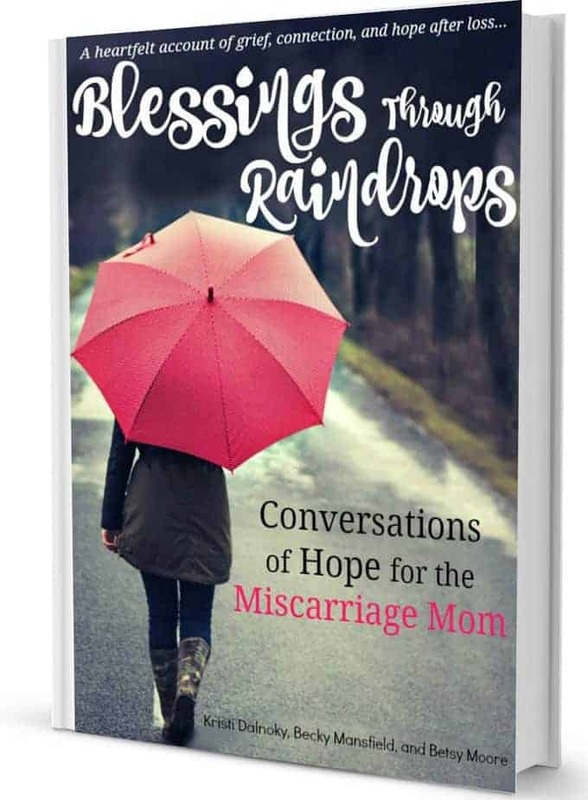 This project has been a long-time coming, so I am thrilled to announce that we have finally released our e-book, “Blessings Through Raindrops: Conversations of Hope for the Miscarriage Mom.” You can find it by clicking here. Betsy Moore of BMooreHealthy, Becky Mansfield of Your Modern Family, and I have set out to create a resource for other moms who have experienced loss through miscarriage. Whether you are experiencing one now or had one many years ago, this book was created with you in mind. At the end of each chapter, you will also find a question/questions or reflection point(s). We thought it necessary to, not just talk at you, but, let you have your voice be heard as well – even if it’s only your own eyes that will ever read the responses. We have found that both writing and talking about our loss has added to our healing, and sometimes, it’s been through the gentle leading of a friend or mentor during conversation that has prompted some of our most valuable revelations. And, because we know that often times you just need to hold a book of this nature in your hands and write your thoughts all over its pages, we are eager to offer a paperback edition in the very near future. If you have any questions about the book, or if you are having difficulty downloading it, feel free to send Betsy, Becky and I an e-mail to miscarriagebook@gmail.com, or contact me directly at kloverhouseblog@gmail.com. From the bottom of our hearts, we hope and pray that this book helps you find an anchor of peace while going through one of the most challenging times in your life. Take comfort in the fact that you are not alone. You are never, ever alone. Welcome to the fiercest, most accepting club we know; it’s an honor to walk this road with you.